Will it spread across the "blogosphere" as fast and furiously as it would if Ken Tremendous had introduced it to his millions of loyal, borderline obsessive readers (like myself)? I, for one, am going to guess "yes". But only time will tell. This will be my last Beirut song for a while... I don't want to give the impression all I ever listen to is Beirut this and Beirut that, no matter how true it may be right now. He plays the energetic and rhythmic style of uke I want to learn, so right now it's a good match. The video goes over the tuning, chords, hammer-ons, strumming, and timing. The song has two very distinct parts, and it switches from one part to the next in about the middle of the song. As usual, it's a tutorial for beginners, but it is a somewhat advanced song that will take a beginner (like myself) a long time to learn and requires a lot of practice. Of course, the song is awesome and was originally played on a uke, so it's a FUN kind of practice where the better you get the more it sounds exactly like the Beirut version. This is also my second entry for the Play It Forward ukulele video contest at ukulelereview.com. This time I totally forgot to pronounce the word ukulele the correct way: "oo-kuhlaylay". Instead, I pronounced it the obviously gringo way, "You-kuhlaylee". I hope it won't sway the judges too much. Oh well, the truth is I'm not Hawaiian and I have to accept that. Until I learn how to play "What's the Matter Here?" or "Like the Weather", I have to represent them here somehow. So my first entry for them is More Than This, which isn't actually their song originally but they do the version I know best. The lyrics and chords page I used can be found here. I am not pleased with my strumming pattern for this song yet, so I am actually a bit disappointed that it's going to be my entry into the Play It Forward Ukulele contest from Julie over at Ukulelereview.com. Oh well, maybe if I do another tutorial before that 4/1 deadline (10 days?) I'll have a better chance to win that sweet FLEA ukulele. By tuning the ukulele up one note on each string (or putting a capo on the first fret), you can play those chords in the more standard C, C7, F, Gm, and A# positions. I might just have that rhythm stuck in my head, which is why I'm not happy with this video overall. If anyone has a better suggestion of how to strum this song, I'd love to hear it (and I don't mean that sarcastically... I'd really love to hear it). I just found out my electronic drummer, Gorch, is moving to Japan (aGAIN). Now, that's all well and good for his life and what not, but it puts some of my Ukulala plans on hold. He has a great ear for drums and musical composition, and he was helping me plan out some interesting songs. Although... he was all the way in Virginia before, so it doesn't actually change much. Hopefully once he gets settled he'll be back on the sequencer, and hard. In the meantime, I want to try working with a real-life percussionist on a few videos. I replied to a craigslist poster (not THAT kind of craigslist poster--a percussionist!) earlier tonight, but... I gave him the link to this website so unfortunately he'll see what an amateur operation I got going right now. The plan is to do a Ukulala cover and video of every song I do a lesson for, and see from there if we get along well enough to "take it to the next level" (not THAT next level--the musical kind!). So... anyone out there know a percussionist in the Boston area? 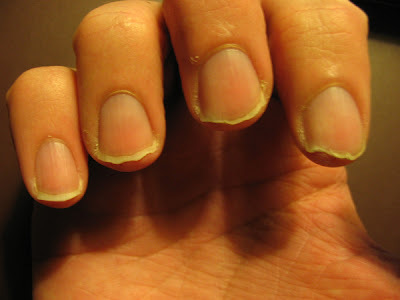 So I've been using a lot more fingernail strumming recently while I play to get that good sharp sound without a pick, but there do seem to be some minor side effects. Will this end my two-year stint as an international ring and nail polish model? No way. It's a very open-minded industry. Alright I decided to do a video on how to play one of my favorite songs from a while back, Plenty More by the Squirrel Nut Zippers. Originally the song is played on banjo, but it's not such a stretch to play it on the ukulele. I also included the fingerpicking part of the song. I play it through very slowly, hopefully it is possible to tell where my fingers are and which string is being plucked. Alright, I decided to start mixin' it up a bit more and add some original content on this blog, so it's not just all videos of tutorials for songs I've learned. I created a second youtube account for ukulala, called ukulalaFORFUN, where I will hold non-tutorial bits and pieces for the blog. I didn't want to put everything on the ukulaladotcom youtube account just in case people that subscribed for tutorials unsubscribe when they start getting other types of videos.